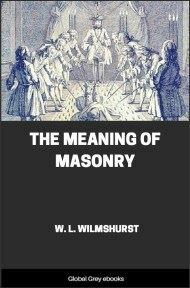 This is a set of essays which discuss the esoteric side of Masonry. 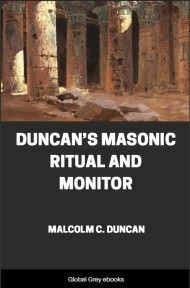 The author attempts to demonstrate that Masonry has a deeper meaning, specifically the striving for human perfection, and is firmly in the mainstream of traditional mystery teachings. 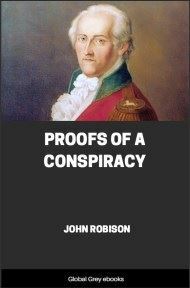 Chapters include; The Position And Possibilities Of The Masonic Order; The Deeper Symbolism Of Freemasonry; Masonry As A Philosophy; Further Notes On Craft Symbolism; The Holy Royal Arch Of Jerusalem; and Freemasonry In Relation To The Ancient Mysteries. THE papers here collected are written solely for members of the Masonic Order, constituted under the United Grand Lodge of England. To all such they are offered in the best spirit of fraternity and goodwill and with the wish to render to the Order some small return for the profit the author has received from his association with it extending over thirty-two years. 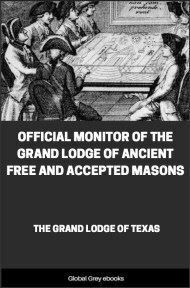 They have been written with a view to promoting the deeper understanding of the meaning of Masonry; to providing the explanation of it that one constantly hears called for and that becomes all the more necessary in view of the unprecedented increase of interest in, and membership of, the Order at the present day. The meaning of Masonry, however, is a subject usually left entirely unexpounded and that accordingly remains largely unrealized by its members save such few as make it their private study; the authorities of what in all other respects is an elaborately organized and admirably controlled community have hitherto made no provision for explaining and teaching the "noble science" which Masonry proclaims itself to be and was certainly designed to impart. It seems taken for granted that reception into the Order will automatically be accompanied by an ability to appreciate forthwith and at its full value all that one there finds. The contrary is the case, for Masonry is a veiled and cryptic expression of the difficult science of spiritual life, and the understanding of it calls for special and informed guidance on the one hand, and on the other a genuine and earnest desire for knowledge and no small capacity for spiritual perception on the part of those seeking to be instructed; and not infrequently one finds Brethren discontinuing their interest or their membership because they find that Masonry means nothing to them and that no explanation or guidance is vouchsafed them. Were such instruction provided, assimilated and responded to, the life of the Order would be enormously quickened and deepened and its efficiency as a means of Initiation intensified, whilst incidentally the fact would prove an added safeguard against the admission into the Order of unsuitable members—by which is meant not merely persons who fail to satisfy conventional qualifications, but also those who, whilst fitted in these respects, are as yet either so intellectually or spiritually unprogressed as to be incapable of benefiting from Initiation in its true sense although passing formally through Initiation rites. Spiritual quality rather than numbers, ability to understand the Masonic system and reduce its implications into personal experience rather than the perfunctory conferment of its rites, are the desiderata of the Craft to-day. As a contribution to repairing the absence of explanation referred to these papers have been compiled. The first two of them have often been read as lectures at Lodge meetings. Many requests that they should be printed and made more widely available led to my expanding their subject-matter into greater detail than could be used for occasional lectures, and accordingly they are here amplified by a paper containing fuller notes upon Craft symbolism. To complete the consideration of the Craft system it was necessary also to add a chapter upon that which forms the crown and culmination of the Craft Degrees and without which they would be imperfect—the Order of the Royal Arch. 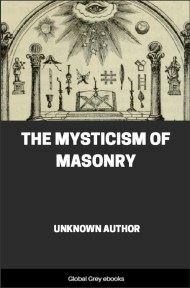 Lastly a chapter has been added upon the important subject which forms the background of the rest—the relationship of modern Masonry to the Ancient Mysteries, from which it is the direct, though greatly attenuated, spiritual descendant. Thus in the five papers I have sought to provide a survey of the whole Masonic subject as expressed by the Craft and Arch Degrees, which it is hoped may prove illuminating to the increasing number of Brethren who feel that Freemasonry enshrines something deeper and greater than, in the absence of guidance, they have been able to realize. It does not profess to be more than an elementary and far from exhaustive survey; the subject might be treated much more fully, in more technical terminology and with abundant references to authorities, were one compiling a more ambitious and scholarly treatise. But to the average Mason such a treatise would probably prove less serviceable than a summary expressed in as simple and untechnical terms as may be and unburdened by numerous literary references. Some repetition, due to the papers having been written at different times, may be found in later chapters of points already dealt with in previous ones, though the restatement may be advantageous in emphasizing those points and maintaining continuity of exposition. 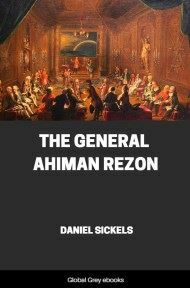 For reasons explained in the chapter itself, that on the Holy Royal Arch will probably prove difficult of comprehension by those unversed in the literature and psychology of religious mysticism; if so, the reading of it may be deferred or neglected. But since a survey of the Masonic system would, like the system itself, be incomplete without reference to that supreme Degree, and since that Degree deals with matters of advanced psychological and spiritual experience about which explanation must always be difficult, the subject has been treated here with as much simplicity of statement as is possible and rather with a view to indicating to what great heights of spiritual attainment the Craft Degrees point as achievable, than with the expectation that they will be readily comprehended by readers without some measure of mystical experience and perhaps unfamiliar with the testimony of the mystics thereto.